The rooms were on the second floor above the kitchen and dining room. The stairs were almost vertical and narrow. There were only two beds in the room, one small bookshelf, and a small light. The bed was actually a sheet of plywood suspended by four posts with a one-inch thick piece of foam on it. There were enough blankets so that I was warm but it did get pretty cold that night. There were windows, but they did not fit well and cold air blew around them. They did not have good carpentry tools so most everything looked like it had been cut with a big knife. We then went downstairs to the restaurant for dinner. They served everyone at the same time family style. This was the only place that we could go to eat. We had the chicken, which they made into a Curry. The chicken was very tough and there was very little meat on it as compared to the chicken I had eaten before. This was a wild chicken that was raised out here in the fields, a free-range type chicken. They also served us a type of bean soup that they called “dahl” and some “roti” (pita bread). As it was the only food we were going to get and we had a long hike tomorrow morning we ate very good. We were going to leave before breakfast (that was the plan) was served so we wanted to get a lot of calories saved up for the long hike tomorrow. We stayed in the restaurant a little after we finished our meal and got a bottle of whiskey and coke. We had a couple of drinks and talked about tomorrows hike and life in general. We went to bed about 9PM. We wanted to be well rested and there was nothing else to do. I was planning to leave at sunrise, hiking out, filming and then hiking back the same day. But of course, my Indian guides told me that we would be leaving about 8:00. I went to sleep in the small room that I shared with another traveler. I woke up early and was ready to go by 8AM. Unfortunately, I was the only one ready to go by 8:00AM. They are not punctual or their value of time is different than ours. When I plan on leaving at 8:00AM I plan on being ready to go at 8:00AM for them 8:00AM meant 9 or 10. This further added to my aggravation for the constant delays we had faced in getting our objective done. We were finally ready to go by 9AM. Our guides were late so that we actually had breakfast, which consisted of fried eggs, beans and rice. This tasted pretty good. I was lucky to have my morning coffee and felt ready to go. Our guides were ready to go, they had actually hiked into town from their homes, some three hours away, already this morning. They had left at sunrise not us. In fact, I later learned that it was possible to hike all the way out to the Shilajit collection area and back in one day. However, we slowed the guides down so they could not make it with us. Due to our not being in shape, the high altitude, the steep terrain and distance required to go there and back in one day. So I put on my backpack walked out to the street, which was actually a muddy, rocky trail that water ran down from the mountain behind us. They had small horses. Not really a mule but definitely not as big as a horse (lucky for me). I had not ridden horses but once in my life and that was some 20 years ago for about 30 minutes. I was more than a little nervous about riding the horse then especially since the saddle did not look like it was on the horse to sturdy. There was a strap that ran around the front of the neck and then another one that ran underneath his tail. This was to keep the saddle from sliding up and back on the horse as he went up and down hills. Of which there were many I would later learn. I climbed on the horse somewhat nervously and the guide then began walking the horse down through the town. 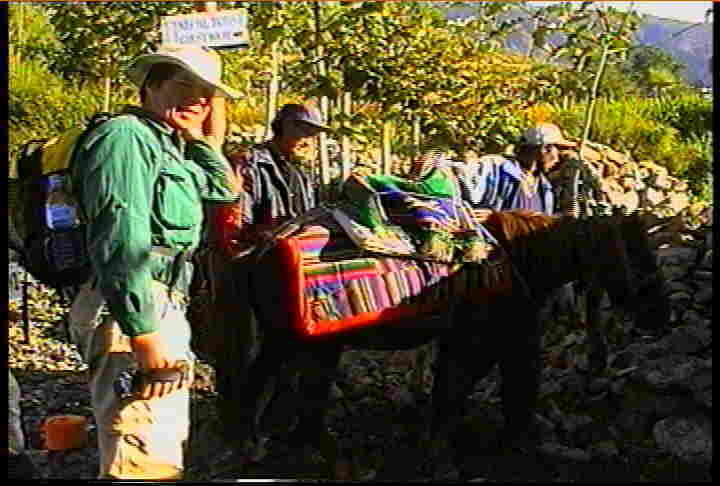 I felt really funny as they were walking, leading the horses for us, and people were looking at us kind of funny. I kind of wanted to walk but they wanted us to ride, as they knew that if we walked we would get tired and not be able to complete the journey in one day as they had anticipated for us. We finally walked through town around to the edge of the mountains and then before we started to go down a steep downhill. I and the other Indian people that traveled with me became very nervous and did not want to ride the horses down the hill. So at that point we got off and we walked. We were climbing down and zigzagging down a very steep hill on a narrow trail there were lots of rocks on the path. I was really happy that I had hiking boots on at that time. I had worn them full-time so that I would only have to bring one pair of shoes on this trip. They were not very comfortable and were inconvenient the entire trip however for this next couple of days hiking it was all worthwhile. The trail was very narrow at points becoming less than one foot wide and generally on the side of the mountain that went down anywhere from a couple hundred to a couple thousand feet. It lowered back and forth along the mountain we generally went down to the bottom crossed the river on a plank bridge that you can look down between the planks and see the river below. I'm glad I did not ride the horse over that. I scared the heck out of me just walking across. 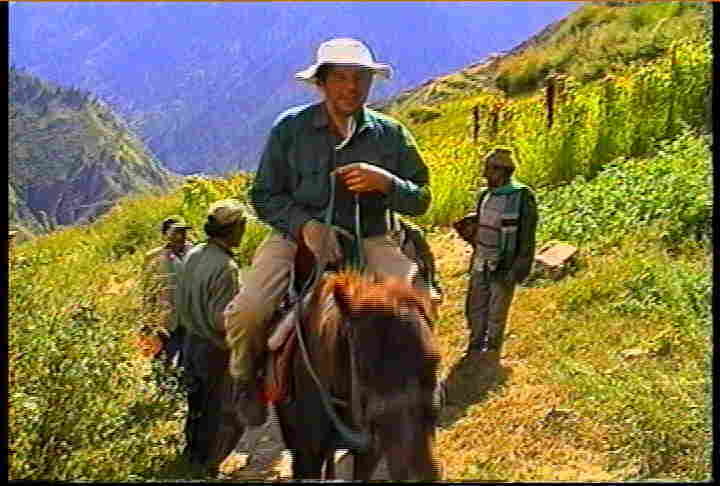 We started climbing up the other side and then I rode the horse uphill as I knew that being at that altitude that I would not be able to climb very far. Luckily, I was in somewhat better shape physically than my fellow travelers were. They were having a hard time, as they were somewhat bigger around the midsection than I was and probably had not done any exercise or hiking in many, many years. Going uphill there were several places that the trail got very rough, very steep and we elected to get off the horses and walk rather than try to ride them over the rough terrain. 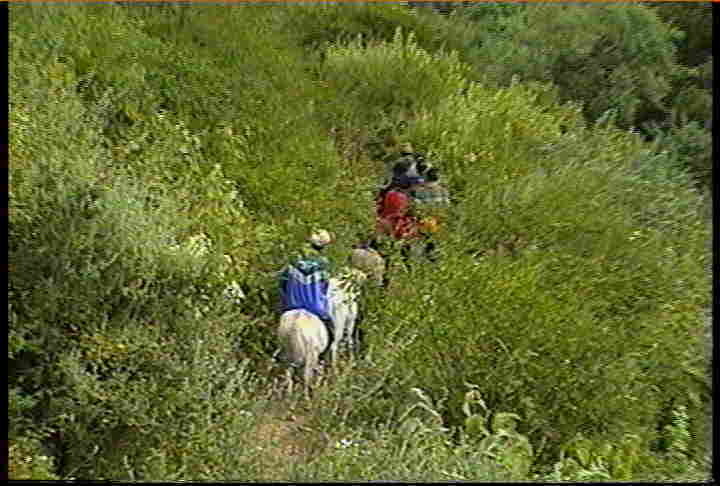 We had not gotten any experience and felt very nervous and uncomfortable riding horses on such narrow paths on the side of a cliff. There were some points we would be riding the trail and brush was hanging out over the path so that you have to lean away from the brush, but if you leaned away from the brush you are leaning towards the edge of the mountain and looking down the edge it was really uncomfortable. So this is how Kumar ended up sliding off his horse three or four times that I saw him and probably a few more that I did not see him. 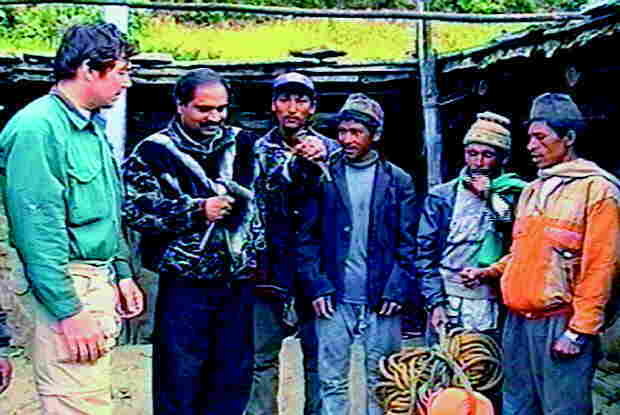 It became an ongoing joke with the guides, as they had to run and catch him. I later learned that one time they were not able to catch him and he fell all the way off his horse and injured his hip. The scenery was incredibly beautiful I could not get over how big the mountains were, how incredible it was that I was here. I realized that I would probably never be there again in my life that this was a one time deal and I wanted to enjoy it as much as I could and remember it as much as I could so I would stop when I was hiking along the trail and you stop and look around and just try to remember everything just enjoy it while I could. However, I also wanted to keep moving and get the video done. We stopped after going for a couple of hours; actually, we would stop probably every half-hour 45 minutes for us to catch our breath and to delay our guides even further. The weather was beautiful it was not too hot, not too cold and a little overcast. We finally came around the bend of a mountain on the narrow trail and down about 1000 feet below us and maybe a mile or so in front of us was a small village or just a group of houses along the side of the mountain. Our guides said this is where we would stop for lunch and that we had another hour to go after this town. As it was 1:00PM then I figured we would be at the town by two and get to the site by three and that we had made good time. When we got to the town, we went to a house. They had cooked food for us. We ate and rested. I took videos of the kids there, made silly faces for them and they all laughed and we entertained each other like that for a little while. We ate some grains that they grow on the mountains and collect mixed in with some green leafy vegetable material that they also collect from the mountains it tasted okay as we were really hungry and that was the only thing we were going to get to eat so we ate it all to fill our stomachs.